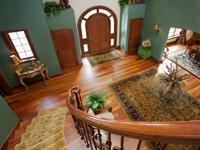 Elegant oriental stair runners. So beautiful. There is just so much available in stair runners today! 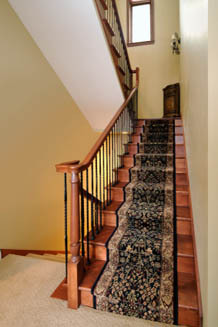 The oriental style stair runner is still just as popular as ever. We also make runners from carpet. This opens up possibilities like solid color runners, berber runners, and many patterns in addition to oriental style patterns. You can get patterns like check, trellis, striped, tone-on-tone, contemporary, transitional, country, and traditional. The result is your home or business can be exactly the way you envisioned it. Runners are perfect when you have beautiful wood stairs and want to enjoy the beauty of that wood. Custom work is a specialty, and affordable. We do custom fitted oriental runners that are beyond the capability of many installers. The difference makes your home sparkle. Cover the step completely if you don't have nice wood floors to show off. 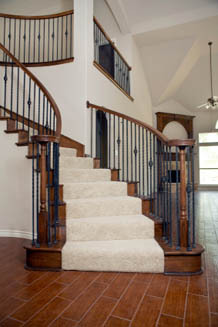 If you do not have finished wood stairs, or if the wood is scuffed or worn, you may want fully covered stairs instead. You have many options. Carpet comes solid or patterned. Patterns can be elegant oriental designs, simple berber textures, subtle tone-on-tones, and so much more. 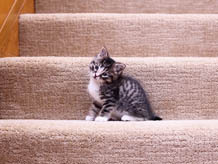 How Much Does Stair Carpet Cost? The clean lines of a solid color stair runner. Roughly, $800 will put a quality oriental style runner on your stairs. 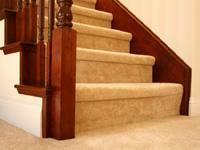 The exact price will depend on the size and configuration of your stairs, and the product you select. On the low side, about $350 will put a functional commercial carpet on your stairs, again, depending the exact size and configuration of your stairs. Removal of existing floor covering is additional. How Do I get stairs that look this nice? 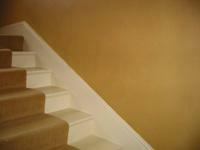 To get stairs that looks this nice, just visit us today. Or call or click to schedule free shop-at-home service. Plush carpet stair runner. The wow factor. Tailored steps.